Before my Snark hunt started in 2008, I mainly focused on Henry Holiday’s illustration to the 5th fit in Lewis Carroll’s The Hunting of the Snark. Since 2005 (as a member of a works council specialized on OHS issues) I used that illustration as a depiction of improvable workplace design. I also inserted the illustration into a Wikipedia article in 2008. Probably from there it was copied into another Wikipedia article in 2012. 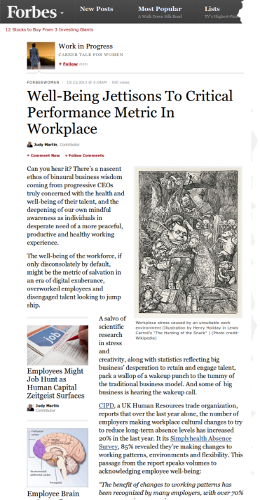 That one again inspired a Forbes article about well-being in the workplace in 2013. In 2008 I read Carroll’s and Holiday’s complete tragicomedy. Then I made an incidental discovery. Ronald Haentjens Dekker and David J. Birnbaum. Washington, DC, August 1 – 4, 2017. In Proceedings of Balisage: The Markup Conference 2017. Balisage Series on Markup Technologies, vol. 19 (2017). 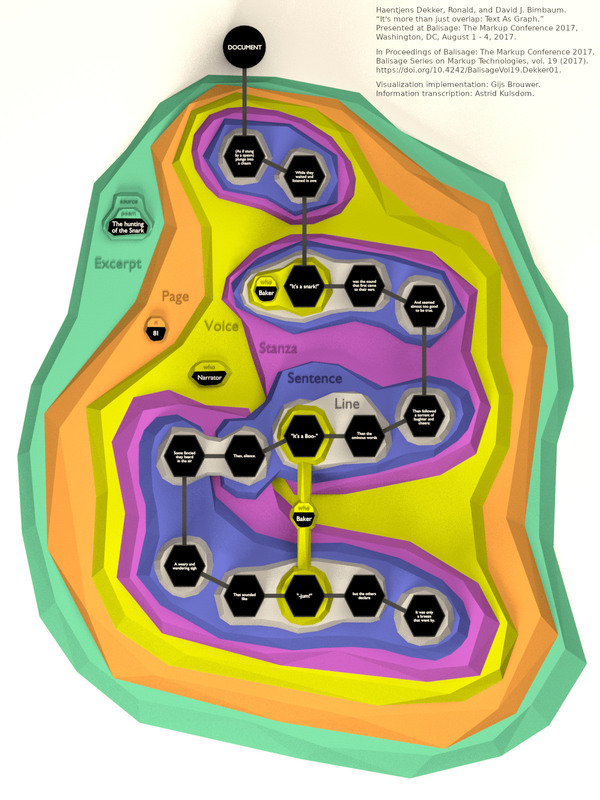 A remark which I received from David J. Birnbaum: Gijs Brouwer implemented the visualization, and Astrid Kulsdom transcribed the information based on the data model inside the application. Gijs’s animated version of the image is available at https://github.com/HuygensING/TAG/blob/master/snark-fly.mp4. his hopeful relative joined a band in the early 13th century – what is his/her instrument of choice? 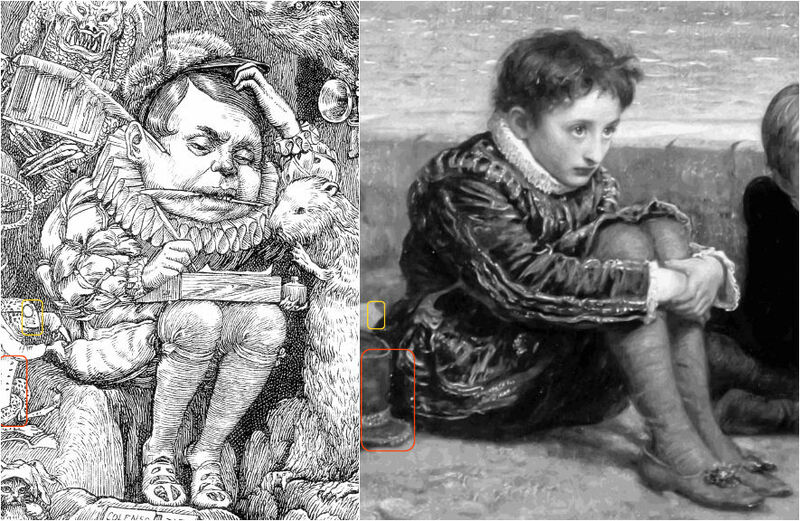 But perhaps Holiday’s ruff – and the pose of the Fit Five drawing – was inspired by the Elizabethan drama inherent in Millais’ Boyhood of Raleigh, (1869). by Mary Hammond, published on Nov 7, 2017. There also is an essay: Mary Hammond, Lewis Carroll’s The Hunting of the Snark Explained. Mary Hammond’s interpretation of course is not the first Snark interpretation. First hints on what the Snark could be about had been given to us by Henry Holiday and Philo M. Buck. 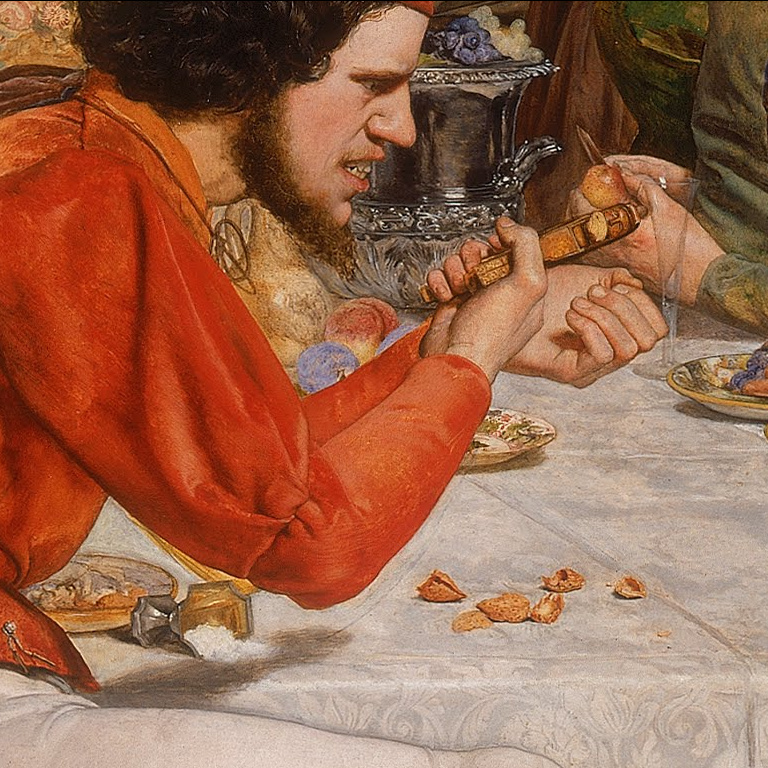 And there is an excellent chapter on Carroll’s tragicomedy in Louise Schweitzer’s One Wild Flower. Oliver Sturm’s Die Jagd nach dem Schnatz is a German translation, which also contains an attempt to explain the Snark. And there is a Snark chapter in Klaus Reichert’s Lewis Carroll: Studien zum literarischen Unsinn. Reichert is another German Snark translator. Among the interpretations known to me, Mary Hammond’s interpretation is the first one where Eternal Damnation is seen as one of the more important issues to which Lewis Carroll might have taken reference in The Hunting of the Snark. In Carroll’s poem, the Baker‘s Forty-Two Boxes led me to the same conclusion earlier. In my correspondence with Mary Hammond (a pen ame of Mary Hibbs) she also told me about what in her view “…jum” in Boojum could stand for: Search for jumble in the chapter Of Reason in John Locke‘s Essay Concerning Human Understanding (1689). I too associate Boojum with the vanishing of reason – which too often is the beginning of violence. Yet, I’ll probably never know, whether my association is similar to what the Boojum meant to Carroll. 550 And seemed almost too good to be true. 556 It was only a breeze that went by. Original post: 2017-11-07. Update: 2018-08-06. The Snark & the Trump, this had to happen: Scott Ponemone’s interview with George Walker. See also “What I tell you three times is true!” and https://twitter.com/ddale8/status/1007605937836838913. 006 That alone should encourage the crew. 329 “’Tis the voice of the Jubjub!” he suddenly cried. 332 “I have uttered that sentiment once. 334 You will find I have told it you twice. Yes, better don’t impugn your leader’s veracity. Even though he will get rid of you rather sooner than later, you don’t need to push it. ["I am a very stable genius!" ,"There are 10 Snark hunters." 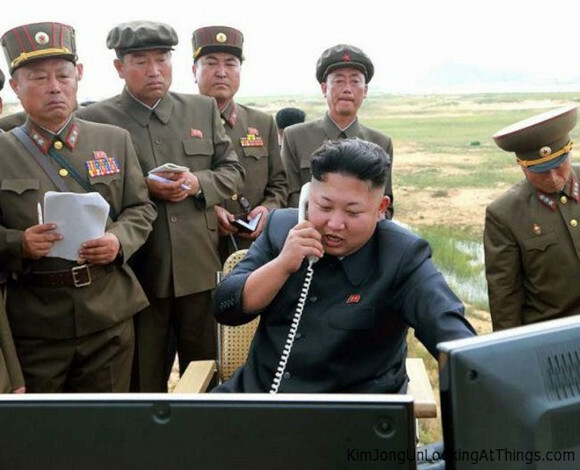 ,"There are 9 Snark hunters." ,"I am a very stable genius!" ,"Brexit promises will be kept!" ,"6 * 7 = 39"
,"6 * 7 = 42"
If you want to prove other claims, just change claims. Advances in technology made it possible for any given literary volume to be published en masse, thus expanding the book market extensibly. Previously, manuscript copies of a writer’s work were limited, due to the laborious effort it took to recreate these volumes; however, following the invention of the printing press, books became less of a luxury item, and, therefore, more accessible to less wealthy households. This caused value to shift from the rarity of a book to its other additive qualities, spurring a tradition of adding corresponding illustrations to increase a books’ aesthetic appeal. Publishers encouraged 19th century writers to include pictures alongside their prose and poetry in order to draw in greater profit for themselves: these companies anticipated greater sales of an illustrated volume that of its unembellished counterpart, and were able to attach a higher price tag to each of these lavish copies. Despite this pressure and undeniable popularity, poets were often still hesitant to publish their works accompanied by such adornments due to the notion that visual aids might skew the reader’s perception of the verse. The choice of Stuart Dodgson Collingwood to include his uncle’s personal sketches [in the Lewis Carroll Picture Book (1899)] indicates an attempt to appeal to the gift book market, and, further, reveals the publisher’s own aspiration to profit monetarily from his personal relationship to Lewis Carroll– notorious author and poet, but lesser-known sketch artist. Through composing this augmented edition of Carroll’s most prominent titles, Collingwood undoubtedly capitalized on this pre-established celebrity while simultaneously preserving his uncle’s notoriety.